We can learn a great deal from these two precious souls! Oh my goodness poor things. Aaaaawwww. Hello King O and Charlie. How precious they are. They bring tears to my eyes. Oh how cute…bless their hearts…. Oh you two are so beautiful, brought tears of joy in my eyes. Here are many wing hugs to you and the staff. They signify what it should be like with the world. If only….. 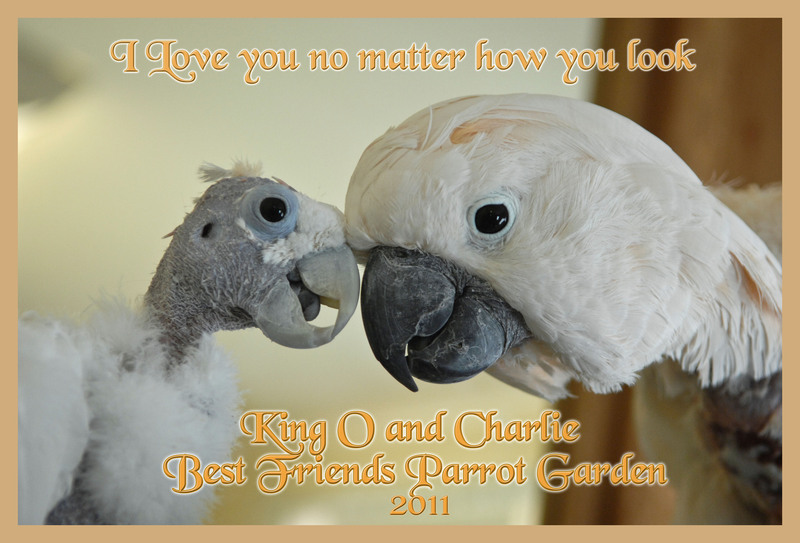 They are the most beautiful birds…..To me it doesnt matter if they have feathers or not. I dont love the feathers I love the bird….There is something very special about a bird that has feather issues. It seems like they have a inner glow about them that makes them beyond beautiful. They’re both gorgoeous–I just want to kiss the cute little earhole on the fella’ (or gal) pictured at left!